How Long Should You Go Between Each Air Conditioning Service? If they are living in Perth, air conditioning service periods for many people can be confusing. The weather can be quite changeable; we have a harsh climate to deal with, and we need our air conditioning to work effectively. If our system fails, our lives can be miserable until we can get it fixed. A regular air conditioning service is a great way to ensure that your system is working correctly. Let’s take a closer look at the process and discover the best times to get your system serviced. Modern air conditioning equipment is a complex system of engineering with mechanical, electrical and moving parts. Like any complicated system, such as a car, each piece of the system relies on the other parts to work effectively. When one part is not functioning correctly, it can adversely affect the other parts causing them to work less efficiently or eventually to fail entirely. When a system is serviced regularly, problems that could get worse can be detected earlier and dealt with. This saves money, as prevention is always cheaper than paying for a more extensive repair that requires more time to fix and replacement parts. The engineer will first carry out an overview of your system and assess the general condition. The system will invariably be dirty due to a buildup of dust and debris that accumulates over time. This will need to be cleaned away from the coils and ductwork so it can work effectively. All the wiring is checked to ensure that it is in good order, free from any fraying and safely connected. All moving parts will be checked to make sure they are running as intended and securely located. If there any problems you need to be aware of the engineer will advise you and a repair or replacement can be arranged. How Often Should Your Service be Carried Out? Many people will simply state that an air conditioning service is required every spring. In fact, it is actually a better to have a service carried out at the beginning of each heating and cooling season. This will ensure that your system is ready to go at the times of year when you need it most. Many companies have scheduled maintenance programs that remind you when a service is due. This is a great option as you never miss a service and you could even get a discount on regular servicing. If they are looking for a local professional company to carry out an air conditioning service, Perth residents should contact us. 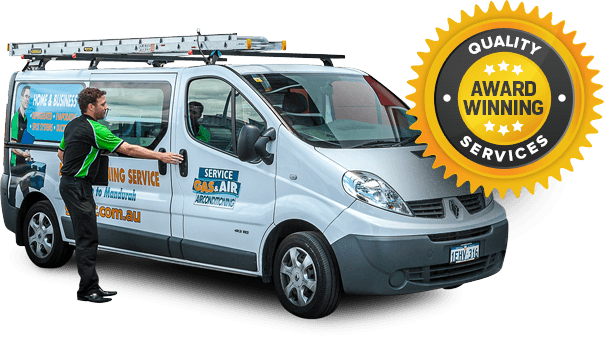 Gas & Air have extensive experience in dealing with all kinds of domestic and commercial air conditioning systems. We offer a high quality service at an affordable price, and we pride ourselves on our attention to detail. If you have any further questions, we will look forward to discussing your needs in greater detail.